Being one of the spots where you can encounter or even dive with hump back whales the Sultanate of Oman caught my interest quite quick. 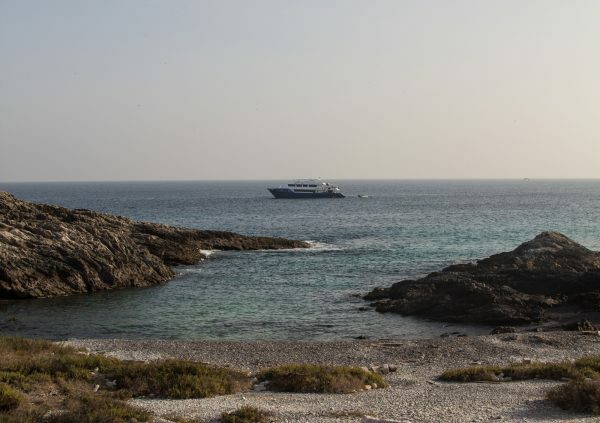 As there is just one boat, the Saman Explorer, at the moment having a license for dive safaris around the coast of Oman, the decision was not hard either. So after I finished the awesome offroad trip from Muscat to Salalah I was excited to leave the dry land and trade it for some shaky planks for the next week. The tour was organised by Extradivers who I would like to thank as they recovered my utility bag including the charger for my underwater lamp out of the rental car during its return to Muscat. They picked us up in Salalah and shuttled us to Mirbat where the Saman Explorer anchored. The Saman Explorer is a properly kept 34 m and 9 m wide vessel, the standard cabins sport a separated bathroom, but are not extremely spacious, if you need room, go for the masters cabin. The diving was great and the spots were fascinating and crawling with life. Due to safety reasons no dives below 30 m were planned, as the next deco chamber was a 1000 km away in Muscat. Besides the diving I met several dolphins during the cruise to the Halliyat islands in the night. I sat on the deck having a good night drink, when the captain of the Saman Explorer told me to follow him to the bow. There he showed the spectacular sight of the glowing plankton in the bow wave, what fascinated me instantly. The captain also explained that you could see larger fish as tunas, makerels and dolphins hunting by their glow caused by the bioluminescence. All of a sudden he pointed out to a glowing spot approaching the vessel. As it came closer we could differenciate three single spots, which were dolphins heading towards the boat leaving behind a slowly fading blue-greenish glowing track. They looked like glowing torpedos aiming at the boat! The three dolphins easily caught upo with the ship and began surfing the bow wave. Even it was a pitch black night, we could recognize their shape exactly as they were illuminated by the plankton. This was almost a surreal sight, i will never forget, the blue bow wave with three glowing dolphins surfing it! I was really grateful to the captain for showing me that great natural phenomenon! Unfortunately I have no footage of it as the light was not sufficent to capture it without a long time exposure. But we also met these lovely fellas at the beginning of a night dive, too! The Omani coast still has huge schools of fish, which are not used to divers and are quite curious about us noisy, big and strange underwater companions. So them often swim up to you and eye you with interest or let you be part of the swarm! The crew very helpful, friendly and polite, careful with the camera gear and fun to dive with! The guides were easy going, which was cool with me as I usually dive on my own with my buddy, but I overheard other guests complaining about it. The food was great and coming with a very friendly service. According to me it was a little sad that we did just two exploring dives, the other dives took place at known spots. As resumée I am content with the diving on the Saman Explorer, I had a great stay there! I just take it as another reason to go back to Oman! Next → Next post: The Transformers paid a visit!